New Preludes by Katherine Hoover and Roshanne Etezady. 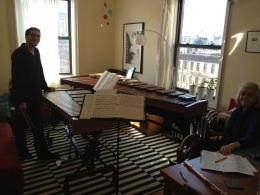 Lawler & Fadoul have spent the last year commissioning and arranging new Preludes for flute and marimba as part of our Gronica Project to expand repertoire for our instrumentation, and we are so excited to be premiering our two commissions in February and March! And fear not, if you can’t make it, you can still hear all of these works on Prelude Cocktail, our new CD due out later this year. Lawler & Fadoul perform a full hour of selections from Prelude Cocktail, including the world premiere of Roshanne Etezady’s Three Preludes: Stop, Drop, and Roll. Lawler & Fadoul perform on a concert honoring composerKatherine Hoover (pictured in rehearsal with Paul, above) for her 75th Birthday. It will be the world premiere of her Two Preludes: Uptown and Out of Town, written for us just a few months ago.